The Eden Campus Energy Centre, an office and meeting space designed by Echo Living, is a true reflection of St Andrews's aim to be the first carbon neutral university in the UK. This unique off grid cabin is on an exposed site just five miles west of St Andrew's campus and accommodates four researchers. Sustainability is at the core of this office design. Mounted onto the roof are nine 320W solar panels that power the whole building, connecting to conventional appliances. A separate storage space houses two Tuff Tanks - one for non potable water and the other for the collection of waste. The Scottish larch clads the side walls, roof and timber deck and is complemented by Slate Richlite rainscreen panels at the entrance and gable ends. Richlite was specified not only for its aesthetic and sustainable credentials, but also as a small tribute to the former paper mill which sat on the site for over a hundred years, until its closure in 2008. 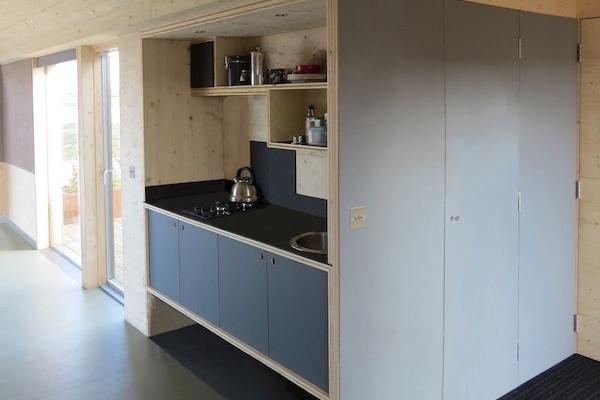 In the interior of the building, the kitchenette features Richlite worktops and walls of untreated spruce panels insulated with sheep wool insulation, which also insulates the floor and vaulted roof. Soft greens, blues and greys, inspired by the estuary, fill the office while double glazed, floor-to-ceiling windows look out onto the estuary and its varied birdlife sustained by the sand flats below.